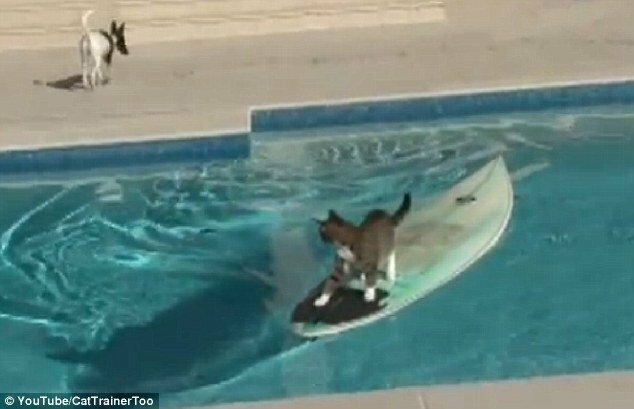 A quick-thinking cat managed to escape a pursuing pooch and surf her way to safety in a backyard pool. The ingenious move, caught in a YouTube video, showed an aggressive Fox Terrier pursuing the feline on a sunny afternoon. But the clever kitty was too quick for her menacing companion, as seen in footage uploaded to the video-sharing website by Robert Dollwet, an American animal trainer living in New South Wales. The cat gracefully jumped on to a waiting surfboard and let the longboard take her to safety. Enjoying a respite mid-pool, she casually glanced back at her pursuer — who was left dumbfounded by her skillful maneuver. After a pause in the pool, the cat concluded her surfing stint. Admitting defeat, the pup stayed on the other side of the water and watched her go her merry way. 50 Cent hits Kanye West by branding Kim Kardashian "trash"